Quite some time has elapsed since we first authored this article and a lot has happened in that time. The HDMI protocol has advanced through several revisions, and USB 2.0 gave way to USB 3.0. Still though, USB-to-HDMI remains a great way to bridge the gap between your computer and your home theater, but there have been some new developments and new technologies that make USB-to-HDMI even easier and more powerful. 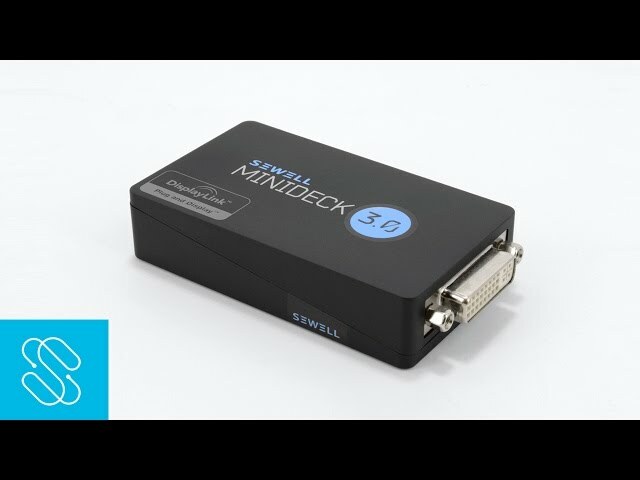 Our new Minideck 3.0 USB-to-HDMI converter distills pretty much all of the advancements into a powerful, easy to use, cool looking package. Join the Sewell Insider program and get 15% off your next order! We’ve received a lot of questions from readers looking to benefit from these advancements, and we’re happy to dispel tech mysteries wherever they appear. Q: What’s the max resolution I can expect from a USB-to-HDMI converter? A: Most USB-to-HDMI converters will support a range of common output resolutions up to 1080p resolution. Atlona's USB to HDMI adapter, also known as the HDPiX2, handles all of your audio and video, allowing you to simply connect a USB cable from an available port on your computer to the converter which in turn processes all the information and integrates the video and audio into a single HDMI line that goes into your TV. The result is flawless imaging at extremely high resolutions: 1920x1200, supporting 1080p on your HDTV. We've tested it in-house and installation is a breeze, the picture is perfect, and the audio/video was perfectly in-sync. It couldn't be easier.